Ömür Harmansah’s current research focuses on the history of landscapes in the Middle East and the politics of ecology, place, and heritage in the age of the Anthropocene. As an archaeologist and an architectural historian of the ancient Near East, Harmansah specializes in the art, architecture, and material culture of Anatolia, Syria, and Mesopotamia during the Bronze and Iron Ages. His earlier research focused on cities, the production of architectural and urban space, critical studies of place and landscape, building technologies and architectural knowledge, and image-making practices in the urban and rural environments. 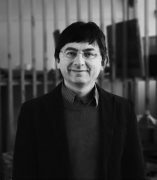 He is the author of two monographs, Cities and the Shaping of Memory in the Ancient Near East, (Cambridge University Press, 2013), and Place, Memory, and Healing: An Archaeology of Anatolian Rock Monuments (Routledge, 2015). He also edited the volume Of Rocks and Water: Towards an Archaeology of Place, published by Oxbow Books (2014). The monograph Cities and the Shaping of Memory in the Ancient Near East has been translated to Turkish and published by Koc University Press in 2015. For other publications, please consult his academia page. Since 2010, Harmansah has been directing Yalburt Yaylasi Archaeological Landscape Research Project, a diachronic regional survey project addressing questions of place and landscape in Konya Province of west-central Turkey. He is also affiliated with the Gordion Archaeological Project at Yassıhöyük (Turkey). He is currently working on a new monograph on landscape history and political ecology in the Middle East, addressing the challenges brought about by the new geological epoch Anthropocene, climate change, and environmental crisis on landscape archaeology and archaeological field practice. This monograph will bring together insights from current debates in new materialism and political ecology to discuss the precarity of archaeological landscapes and cultural heritage under the impact of late capitalism. He is the Principal Investigator for the 3-year multi-institutional collaborative project entitled “Political Ecology as Practice: A Regional Approach to the Anthropocene”. This project is supported by the Humanities Without Walls consortium, based at the Illinois Program for Research in the Humanities at the University of Illinois at Urbana-Champaign. The Humanities Without Walls consortium is funded by a grant from the Andrew W. Mellon Foundation. Born and raised in Turkey, Ömür studied architecture and architectural history at the Middle East Technical University (Ankara, Turkey), and received his PhD from University of Pennsylvania in the History of Art (2005). He previously taught at Reed College (Portland, OR) and Brown University (Providence, RI) before joining the faculty at UIC’s School of Art & Art History in 2014. He received various sabbatical and research awards, including Koç University’s Research Center for Anatolian Civilizations Senior Fellowship (2009-2010), Brown University’s Cogut Center for the Humanities Faculty Fellowship (Fall 2012), and University of Texas at Austin’s Donald D. Harrington Faculty Research Fellowship(2013-2014). Recently, he has been elected as a “Rising Star” in Art, Architecture, and the Humanities among the 2016 Researcher and Scholar of the Year awards distributed by the Office of the Vice Chancellor at the University of Illinois at Chicago.